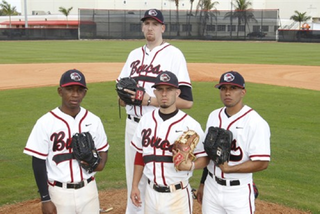 Barry University pitcher Frank Szczepanik is 7-foot-2, which is four inches taller than the man he grew up idolizing, Randy Johnson. The novelty aspect has been covered a bunch lately, but the interesting aside is that, while in high school in Linden, NJ, he underwent open-heart surgery because of a life-threatening condition. The fact that Szczepanik, a walking time bomb a year ago, will even toe the rubber this spring is, in Mondelli's opinion, a miracle. Should he ever make the bigs, he'll have a quarter-foot on the height-iest MLB pitcher ever, too. On the downside, his Barry U. coach Mark Pavao seems to hint that is a longshot. "I remember when he first got here and he was fielding a ground ball or a bunt off the mound, and by the time he'd bend down and stand up, the runner was practically on second. So his ability to improve that part of his game has been huge for us." On the upside, "The Bigger Unit" is a damn good nickname to have, provided you have the goods with which to back it up.